Congratulations to Mark Radoja, Winner of Event #16: $10,000 Heads-Up No-Limit Hold'em ($331,190)! One of the more interesting events on the World Series of Poker schedule has officially come to a close. Mark Radoja was able to navigate a field of 162 entrants to come out on top of Event #16: $10,000 Heads-Up No-Limit Hold'em, capturing the gold bracelet and the $331,190 first-place prize money in the process. The third day of play began with four players returning and vying for the gold. On the secondary feature sat relative unknown Don Nguyen who had clinched his first WSOP cash with this event. Nguyen squared off with online legend Ben "Sauce123" Sulsky. All eyes were on Sulsky as the man who has consistently dominated the virtual felt was in the midst of a deep run in one of the most prestigious live tournaments around. Nguyen, however, made quick work of Sulsky, defeating him in just 41 short hands. On the final hand, Nguyen raised to 60,000 from the button, Sulsky three-bet to 145,000, Nguyen pushed out what looked like 800,000 in chips, and Sulsky moved all in for 935,000. Sulsky showed and was ahead of Nguyen's . However, after the board ran out , Nguyen was able to seize victory with his straight and secure his seat in the finals. Simultaneously, Radoja played Justin Bonomo over on the ESPN Main Stage in the semifinals. 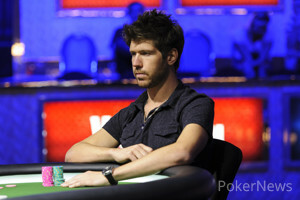 Bonomo was the clear aggressor in the match, winning most of the smaller pots. However, Radoja seemed to hold when the money got in and eventually Radoja was able to clinch a victory over Bonomo. During their final hand, a short-stacked Bonomo moved in from the button holding and Radoja snapped him off with . An ace peeled off on the flop and that was all she wrote for Bonomo, who was eliminated in the semifinals taking home $110,485. A mere half hour later, Radoja and Nguyen took their seats on the feature table to play one last match for the championship. Nguyen took an early lead and forced Radoja to cash in one of his add-on's fairly early. Radoja found a huge double about halfway through the match when his pocket queens were able to hold against Nguyen's during a preflop all in. Despite this, Nguyen had managed to work Radoja down to cashing in his final lammer, meaning Radoja had a huge uphill battle to seize the victory. From this point on, Radoja worked the short stack to his advantage by winning small pots by shoving all in and taking advantage of the ever-raising blinds. On the 83rd hand of the match, Nguyen moved all in from his button and Radoja snapped him off with pocket sixes. The pocket pair held and Radoja was able to completely turn the tide on Nguyen, who was left with only one lammer to cash in. A mere two hands later Nguyen shoved his short stack from the button and Radoja called for the tournament. Nguyen's ace-high was ahead and it stayed that way when the flop hit the felt. The on the turn made it more likely that the match would roll on, but the on the river brought everything to an abrupt halt with Radoja eliminating his final opponent and seizing WSOP glory. 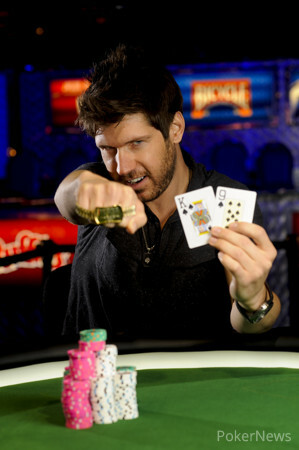 PokerNews would like to extend its deepest congratulations to Radoja who is taking home his second WSOP braclet. That does it for our coverage of heads up action, but be sure to check out our Live Reporting page for immediate coverage of all of the remaining events at the 2013 WSOP! Hand #84: Mark Radoja announced all in from his button. Don Nguyen folded. Hand #85: Nguyen moved all in from his button and Radoja announced a call. "Come on, man!" yelled Radoja seeing he was behind at this point. "King of hearts ONE TIME!!!!" The flop came and Nguyen's ace-high remained in the lead. Radoja would need to pair up on the next two streets in order to end the tournament here. Nguyen came one step closer to doubling on the turn and needed to dodge a king or a nine on fifth to stay alive. 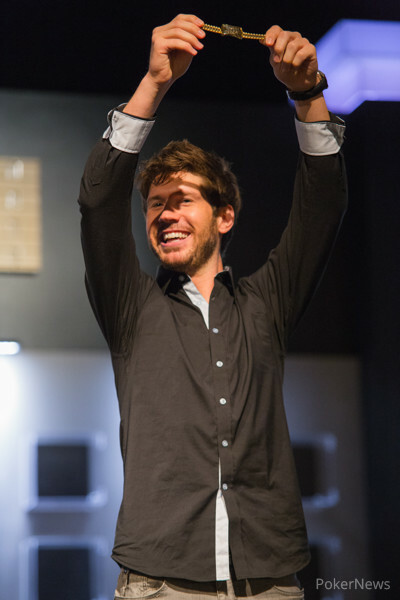 The dealer produced the river- the and Radoja screamed with pure joy, securing his second WSOP victory. 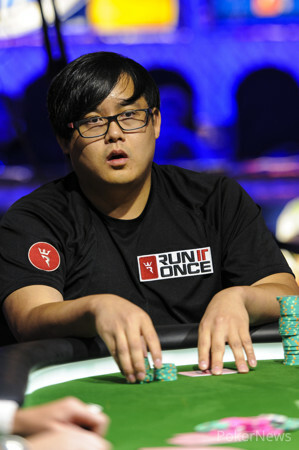 Nguyen was eliminated in 2nd place and will take home $204,648 in prize money. Hand #81: Don Nguyen folded his button. Hand #82: Mark Radoja raised all in from his button and Don Nguyen called. Radoja showed and Nguyen tabled . The board ran out and the two chopped the pot. Hand #83: Nguyen moved all in from his button and Radoja snapped him off. The flop came and Radoja's sixes retained the lead. The was of no help to Nguyen and he needed to spike an eight on the river in order to stay alive. Unfortunately for Nguyen, fifth street was the and he was forced to ship his stack over to Radoja. Nguyen then fired his last bullet by cashing in his final add-on for 1.28 million in chips. Hand #79: Nguyen opened for 240,000, Radoja shipped it all-in, and Nguyen called after mulling his options for a few moments. Radoja's was ahead of Nguyen's , and a clean runout of gave him the pot, forcing Nguyen to cash in a 1.2 million chip lammer. Hand #80: On the next hand, Radoja punished his reeling opponent with an all-in move before the flop, and Nguyen mucked immediately. Hand #74: Radoja opened for 240,000 and Nguyen called to see the flop of . After Nguyen checked, a bet of 165,000 earned Radoja the pot. Hand #75: Nguyen opened for 240,000, Radoja called, and the dealer fanned a flop of . After a check by Radoja, Nguyen bet 140,000 and took it down. Hand #76: Radoja opened for 240,000, Nguyen called, and they saw a flop of . Nguyen then check-folded to Radoja's 165,000 wager. Hand #78: Radoja limped in, Nguyen raised to 280,000, but folded when Radoja reraised to 780,000. Hand #71: Mark Radoja called from the button and Don Nguyen checked his option. The flop came and Nguyen fired 125,000. Radoja called to see the hit the turn. Nguyen slowed with a check and Radoja fired 140,000. Nguyen mucked and Radoja took it. Hand #72: Nguyen opened to 240,000 from his button and Radoja folded. Hand #73: Radjoa raised to 240,000 from hit button and Nguyen tossed them away. Hand #67: Mark Radoja shipped all in from the button and Don Nguyen folded. Hand #68: Nguyen folded his button. Hand #69: Radoja called from the button and Nguyen checked his option. The flop came and Nguyen checked. Radoja fired 120,000 and Nguyen called. The turned and both players checked. The board completed with the and Nguyen checked again. Radoja bet 305,000 and a moment passed with Nguyen thinking. "Alright," sighed Nguyen, throwing in a call. Radoja showed for a straight and Nguyen mucked his hand. Hand #70: Nguyen raised to 240,000 from his button and Radoja three-bet all in. Nguyen folded and Radoja took it down. Hand #64: Don Nguyen raised to 160,000 from the button and Mark Radoja three-bet all in. Nguyen folded. Hand #65: Radoja button-raised to 160,000 and Nguyen replied by announcing all in. Radoja folded and Nguyen took it down. Hand #66: Nguyen folded his button. Weclome to the Final Four of Event #14, the $10,000 Heads-Up No-Limit Hold'em Championship! Mark Radoja with the win!